A genuinely remote and pristine fishery made even more unique from a well-established pearl farm as your base. The infrastructure provided by Paspaley Pearls at Kuri Bay has a great charm and is set in the most stunning of coastlines. 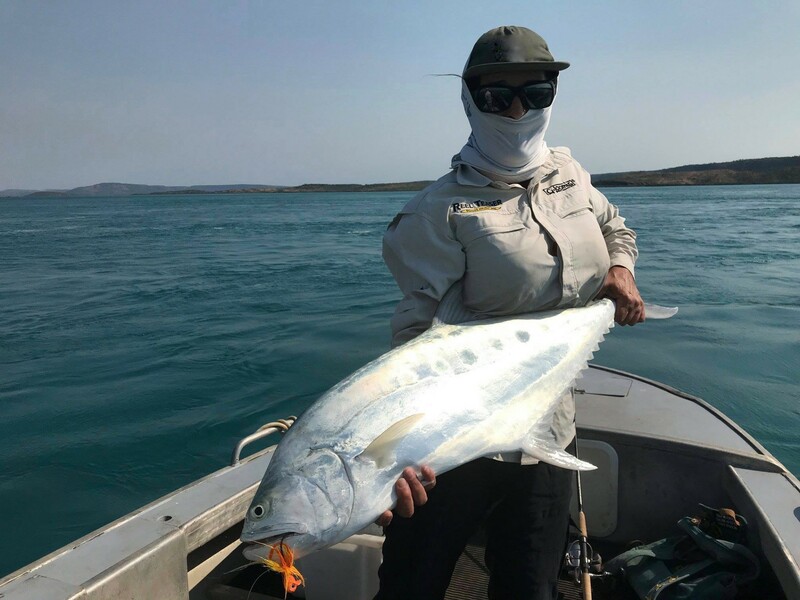 All this combined makes for one of Australia’s most exciting new fishing lodges in the remote North West of Western Australia. 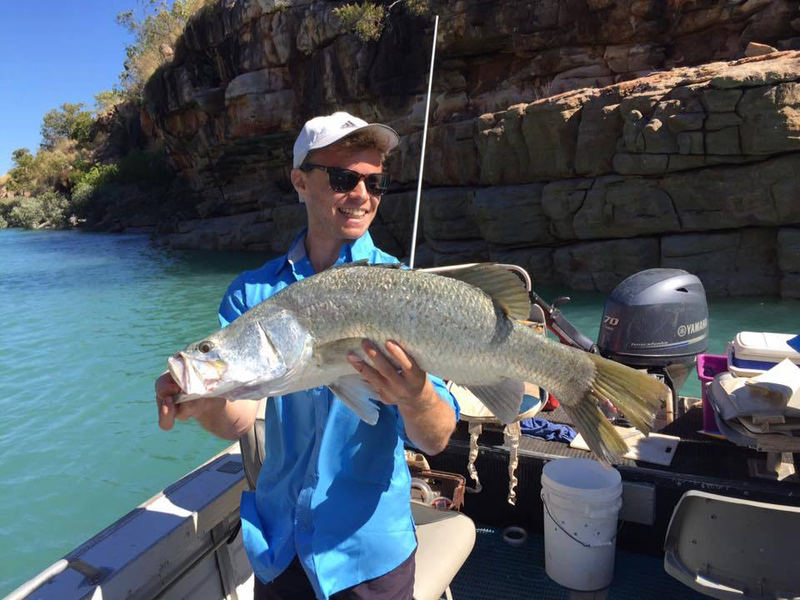 Access is by seaplane, this is a big highlight of your time at Kuri Bay, flying over two of the Kimberley coasts iconic landscapes, the Horizontal Falls and the Montgomery Reef. They pride themselves on their cuisine; your meals are a high light with fresh fish from the days catch prepared differently every evening, Oysters collected by you and homegrown greens picked from the local patch. 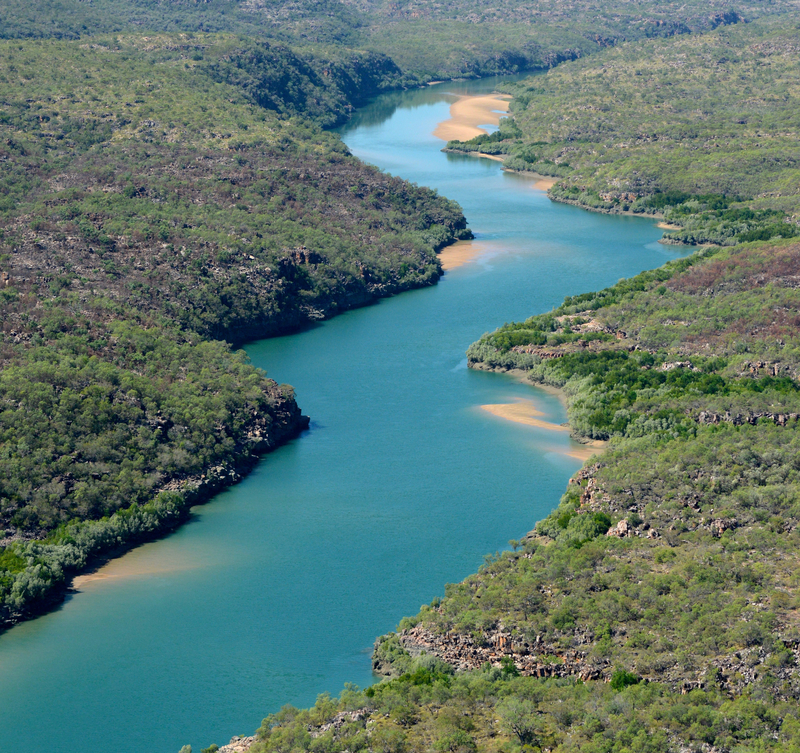 One of the most biologically significant regions of the world, the area’s wildlife is prolific, including, birds, turtles, snubfin dolphins, crocodiles, dingoes, Rock wallabies to name just a few. 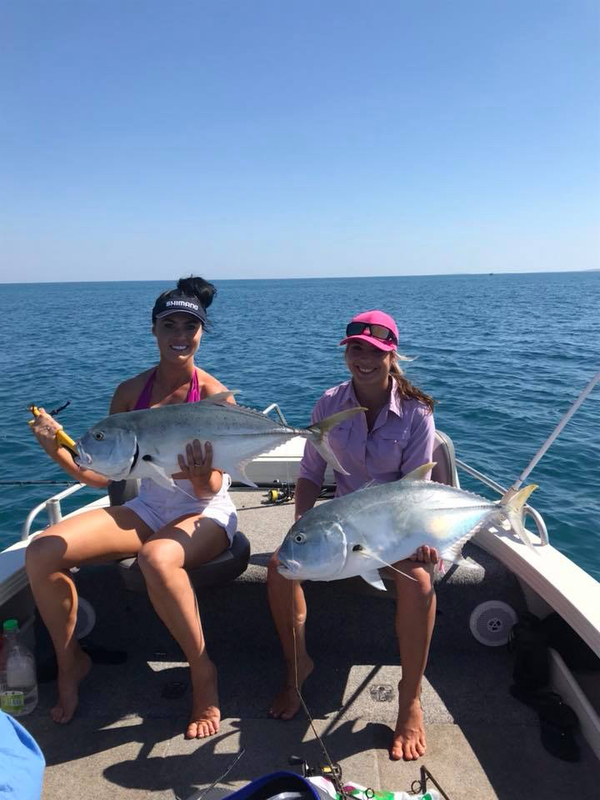 But we know its the fishing that you are interested in… sight fishing the many bays, headlands and creeks this is going to be a fishing adventure to remember. 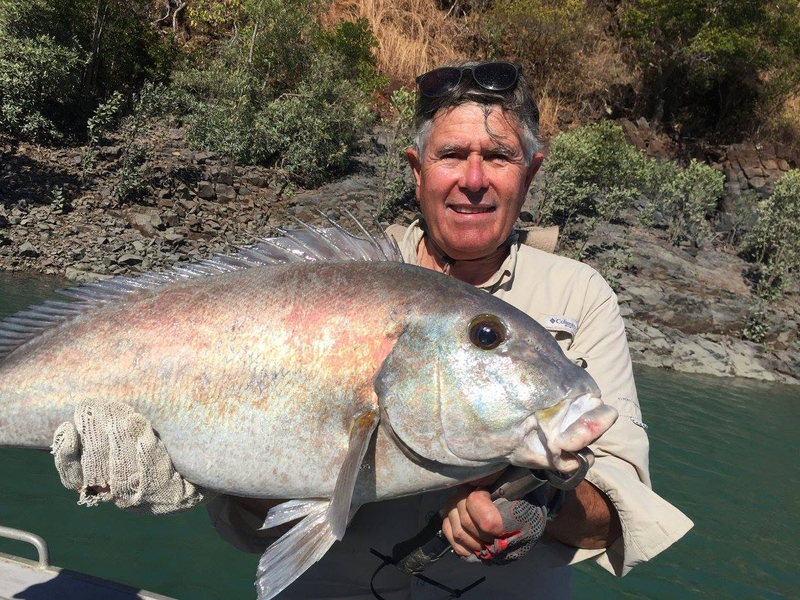 The variety of fishing scenarios that are on offer in the waters around Kuri Bay is its greatest attraction. 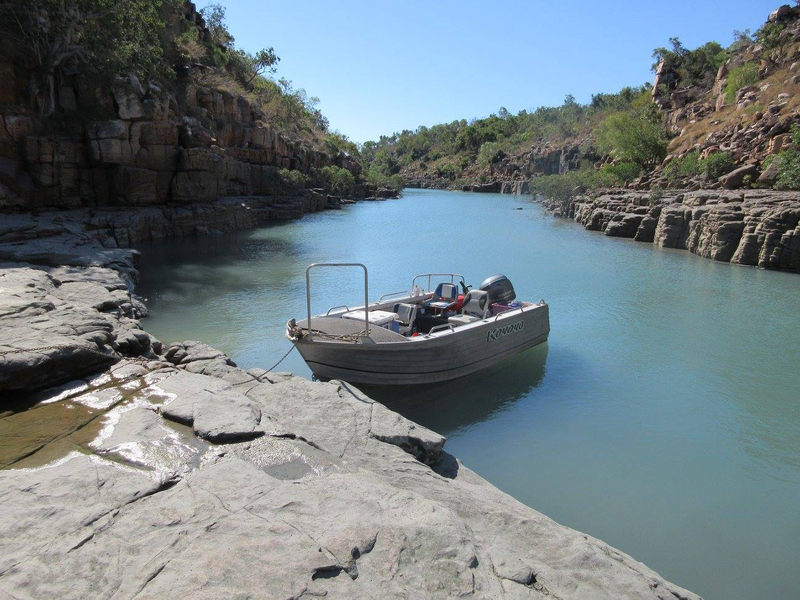 Those that like the long-wand the crystal clear sand flats (unusual in the Kimberley region) off some serious flyfishing action. Stalking Blue Bastards on the reef flat fringers is stuff dreams are made of… maybe a bone or permit might be on offer. 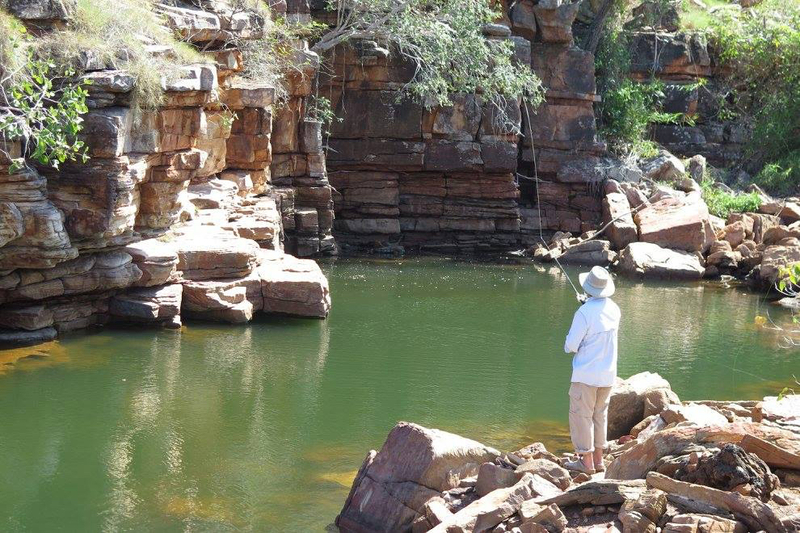 The real fishing beauty of the Kimberley area is that there is almost always something for everyone. Sand flats, gorges, estuaries and creeks, deep jigging, pelagic action, coral reefs. Then after that, you can start to get serious! 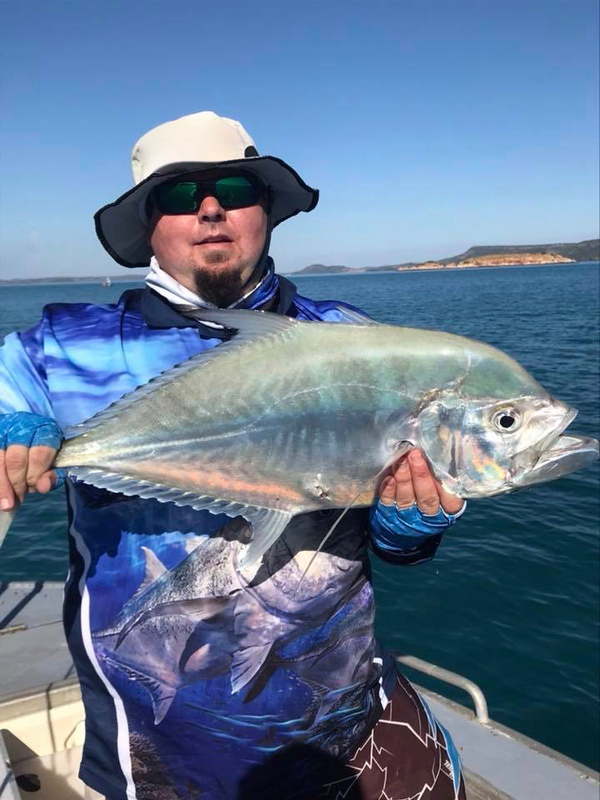 If you like casting lures or flies all day on light tackle or hunting down big fish on sand flats to jigging up massive trevally’s and other monsters pelagic or maybe trolling for sailfish, it is all there within an hour boating of your accommodation. This is not a location where you have to make a cut lunch to just get to your fishing grounds. It is not uncommon to catch and release over 40 species of fish in your stay at Kuri Bay. 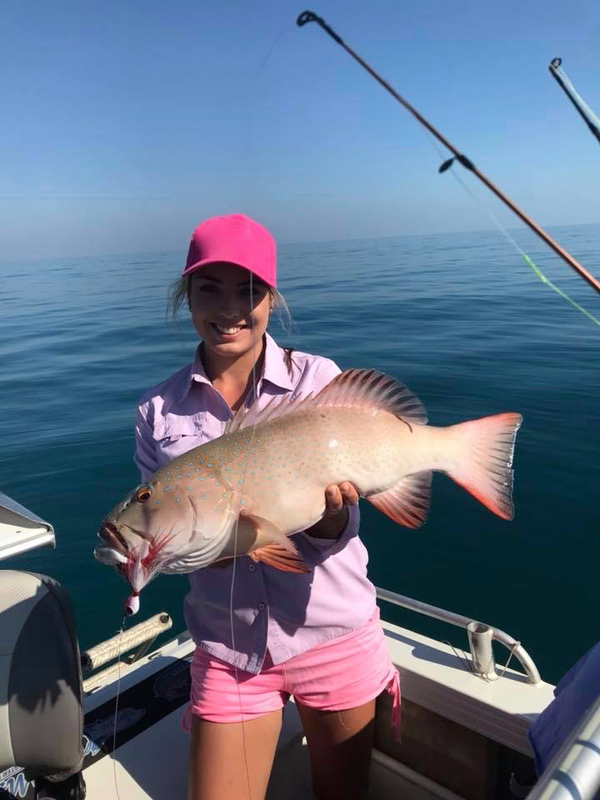 Something Australian waters are famous for sidenote (when casting to a nice GT my plastic was smashed by a Coral Trout) #australiasportsfishing Lets talk species, Mangrove Jack, Finger Mark, Bream, Barramundi, Threadfin Salmon, Blue Bastards , Brown Bastards, Queenfish, GT, Goldens, Mackerel, Sailfish, Cobia, Tuna, Coral Trout, Spangled Emperor, Red Emperor… just for a start. 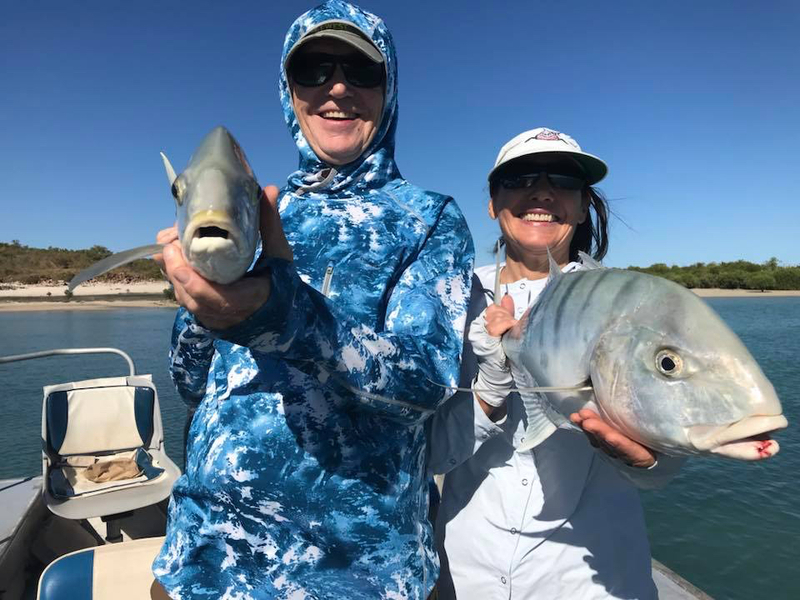 The guides at Kuri Bay are all long-term Kimberley fishing guides, who have worked extensively along the Kimberley coast and have gained a wealth of knowledge. 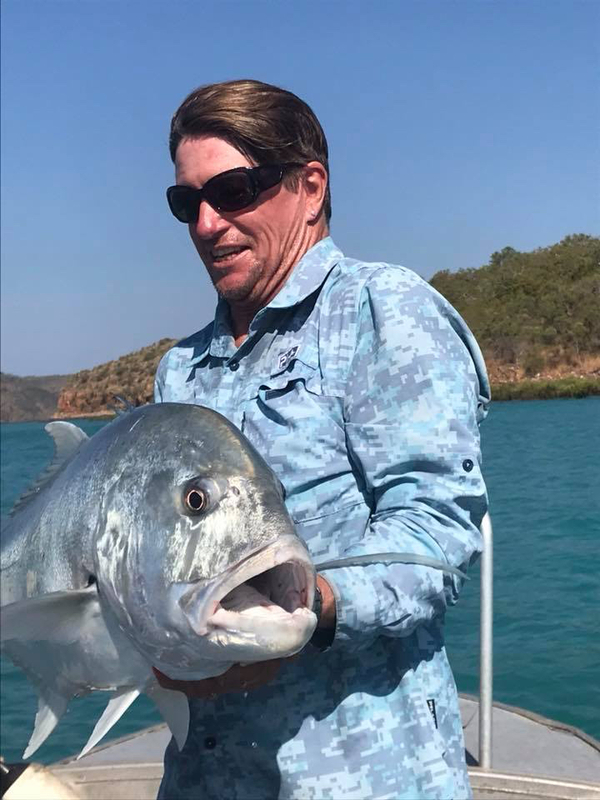 Under the expertise of Peter Tucker considered by many as the most experienced and knowledgeable Kimberley Fishing charter guide on the Kimberley coast, you can trust you are going to have a memorable and professional weeks fishing. Fishing is fishing and anyone that can guarantee you that you are going to catch fish is selling tickets to a Bangkok catfish farm. I love the moment a fish strikes but we have all had days where ‘that’ strike has been few and far between. Food makes the difference on a bad day’s fishing. You know that the food is better than good when you get to the end of a days fishing, and you’re not sad that you are heading back to the lodge. All you can think about the fresh Salt & Pepper squid and those amazing garlic and chilli tiger prawns. Yes and maybe a nice cold beer or glass of wine. Kuri Bay takes their food seriously without being pretentious. If you want a seven-course degustation meal with matching wines (not that there is anything wrong with ‘that’ seven-course degustation meals) you will head to the Farm in the Barossa Valley (it is amazing BTW). But that is not the experience you are looking for. This is great local produce down well, and there is plenty of it. What is a good nights sleep worth to you? Each room has mains power for those that need a sleep machine, and of course, this is good for everyone else. 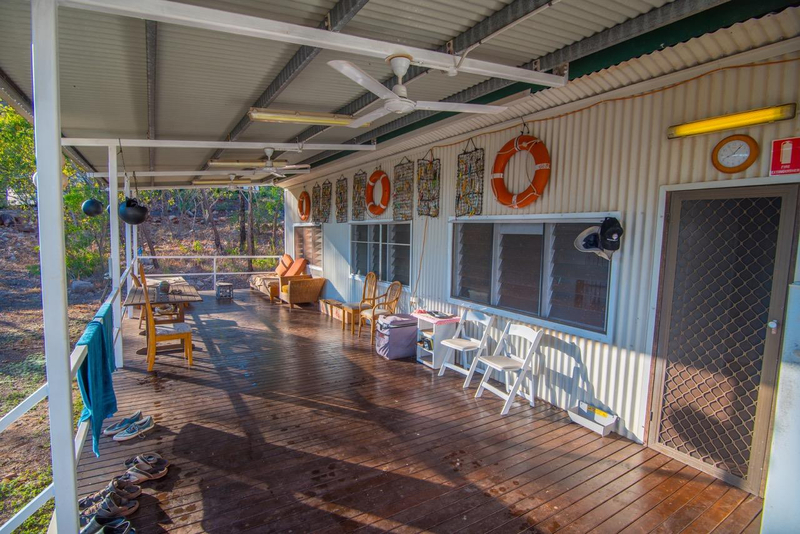 Kuri Bay offers very comfortable accommodation and facilities for you and your group. Spacious dormitory style accommodation with your room that has 24 hr power, overhead fan, thoroughly screened louvre windows, and plenty of shelf space. A balcony extending the length of the building with all the comforts to relax and enjoy the surrounds and mingle with your friends after a great day out on the water. A well-appointed ablution block with hot and cold showers, flushing toilets, large sinks and basins and washing machine and dryer all make your stay in a very remote area extremely comfortable. Available also is the self-contained manager’s cabin that offers complete privacy and stunning views, ideal for families or couples. The team at FishingEarth will work with you to put together the most cost-effective and time-efficient travel plans for you. We will work with you to make sure that your budget and time limitations are taken into account and the best route there and of course the best route home. A FishingEarth we get excited for you when you are going on a FishingEarth Fishing Adventure. But the thing that makes us smile is when you walk in your front door ‘home’ safe and sound. The first week in March through to early December. Depending on the type of fishing that you are looking to do depends on the time of the year. It can also get pretty hot early in the year and hot and humid in the build-up at the end of the year. Either via Darwin or Broome. We work with you to find the best way to get to Kuri Bay and then home. A. This is not a Barramundi mecca. Good sized fish are caught but not in significant numbers… in saying that for those willing to work hard there are good fish about. A. Light tackle game fishing put the area on the map. It was not until early fishing explores started getting up in the seemingly never-ending bays of the area that they truly could appreciate the fishing wealth. A. Yep, each day the staff will wash anything you need to be cleaned. A. No there is no reception, but they do have a satellite phone. If you need a break from the hustle and bustle of the modern world put down your phone and take a fishing adventure to Kuri Bay.